When you next hide a small geocache will you ensure there is something to write with inside? Will it be a pencil? Will it be stolen from Ikea or Keno? Will you include a pencil sharpener? Will it break each someone goes to use it? For your next small cache hide, get a small pen. Made from regular sized BIC pens you know that BIC means you are getting a quality product. 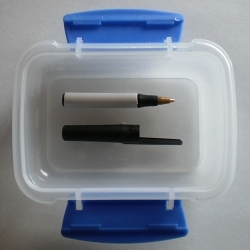 Each pen is approximately 70mm long and fits into a small sistema container with ease. Each pen comes with its own cap ensuring that there are no more holes made in your ziplock bag and that there will always* be something to write with. You could always make your own; but why spend the time to go to the shop, buy some pens, cut them down to size, cut the ink tube getting ink and mess everywhere when you can buy them from Geocaching Australia, have them delivered to your letterbox and help Geocaching Australia out along the way. Style and colour may vary from time to time. Note: The small sistema container in the picture is included for size and illustrative purposes only. * Excluding the caches that Ikea or Keno have visited and riipped off your pens.